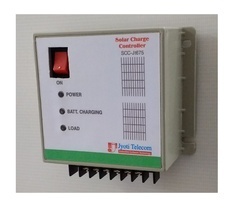 We are a leading Manufacturer of solar charge controller and micro controller based solar charge controller from Nashik, India. Load cut off setting is 10.0 v, when load is connected and battery voltage drops below 10v, load will be disconnected & when panel voltage is available battery charged and reached to 12v level load will be connected automatically. This processes continuously monitored and maintained. Ø Noise Less Output to the load. Ø Microcontroller based reliable and rugged design. Ø Compact, less Component hence very less failure. Ø Tickles charging hence battery top up charge maintain. Indicated by Red Led on off slow. Ø No fluctuations, sharp cut of levels. Ø Load output on is indicated by Yellow Led. Ø Load Cutoff due to Low Battery is indicated by Flashing of Yellow Led. 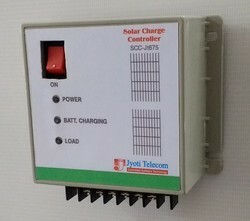 Solar Charge controller, controls over charging of the battery from the solar panel. Solar PV will charge battery if it is in charged condition then load will be also connected. Load current will be shared from PV or from battery which is more and it will be share mutually.